The Philosophy of the AMCA continues directly from that followed by the four successful business men who founded the club in 1954. These men collected, preserved, and restored old motorcycles, thereby saving a segment of early Americana. These were family men who envisioned a club operated in such a manner as to include all family members at the clubs' events. 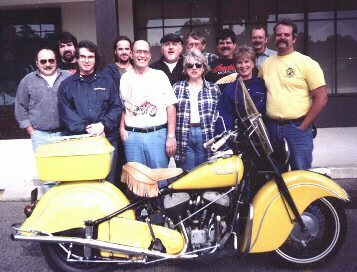 They felt that a great deal of wholesome fun and enjoyment would result from sharing their interests in old motorcycles. Club memberships has always been opened to all enthusiasts and interested persons. No restrictions of any kind have been set as to race, creed, color, make of bike, nationally or country of residence. The Dixie Chapter is newly formed. It has received final national approval. It had its first meeting on November 15, 1997 in Augusta, Georgia. Officers and directors were elected and many items were discussed. Items discussed were upcoming events, a newsletter, chapter logo, and weekend riding trips. Any Georgia or South Carolina AMCA member are welcomed to join the Dixie chapter. OFFICERS LINKS Membership Application Email Webpage created by Cassie Mathews.